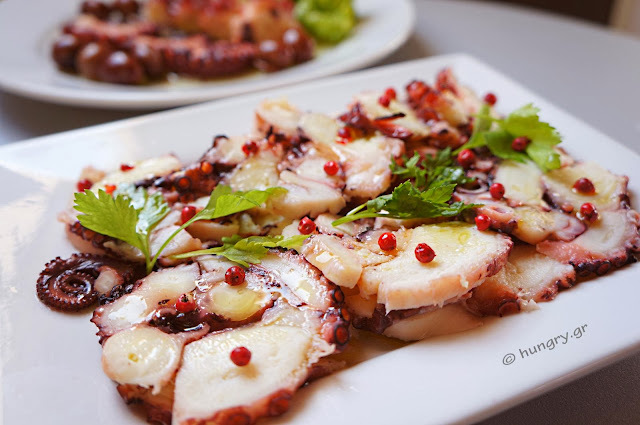 Also the term Carpaccio is often used to include recipes cooked. 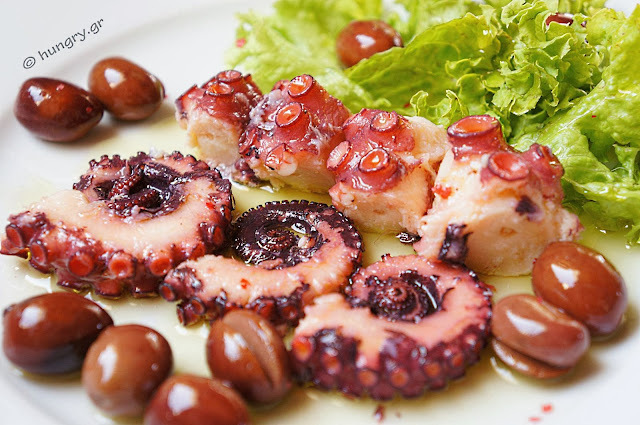 This is the case, for example, of Octopus Carpaccio. 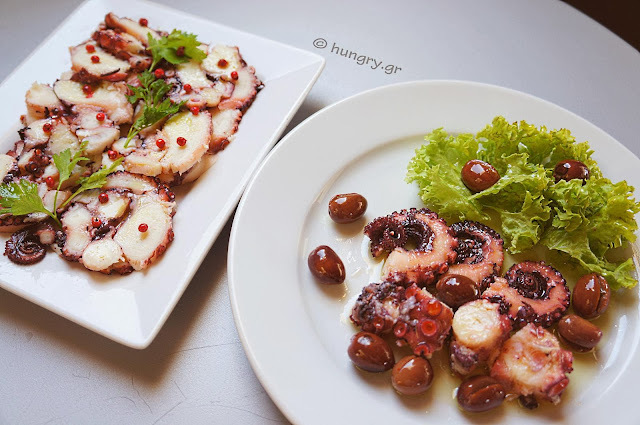 The recipe involves cooking the octopus before the Carpaccio process of production/cut. 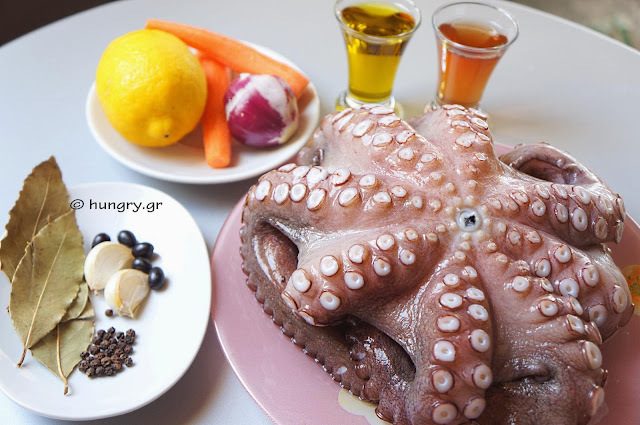 In a simple cooker or pressure cooker put 1 liter (2.17 pints) of water to boil and add all ingredients except the octopus. 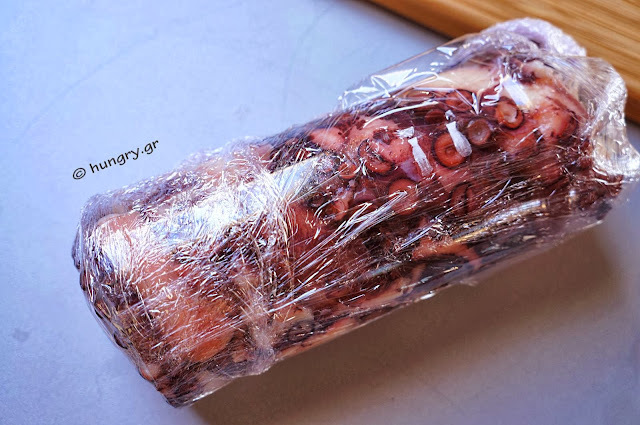 Once the water begins to boil vigorously, you hold the octopus by the hood, with the tentacles hanging down, and immersed in boiling water, only the edges and in the length 10 cm (4 in), about 3-4 times. So that the edges of the tentacles are curled and get a pretty twisted shape. 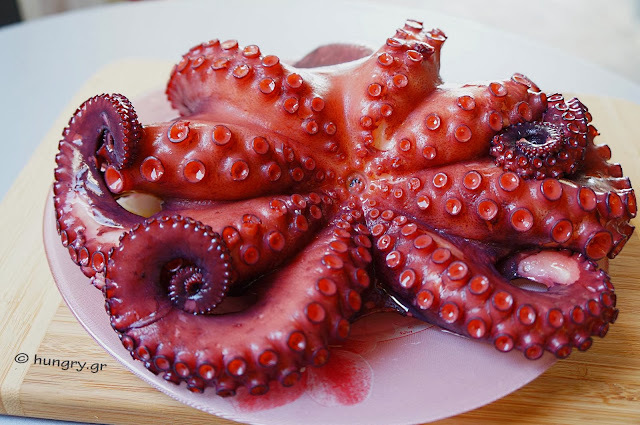 Place all of the octopus in the water and boil for 30'-40' or as needed to cook and soften very well. 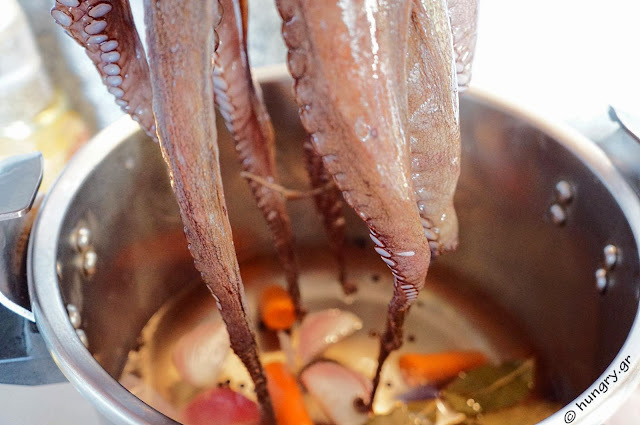 You remove it from the kettle and leave to cool on a platter to be able to cut. All other materials along with the water pour into the sink. You do not need them. 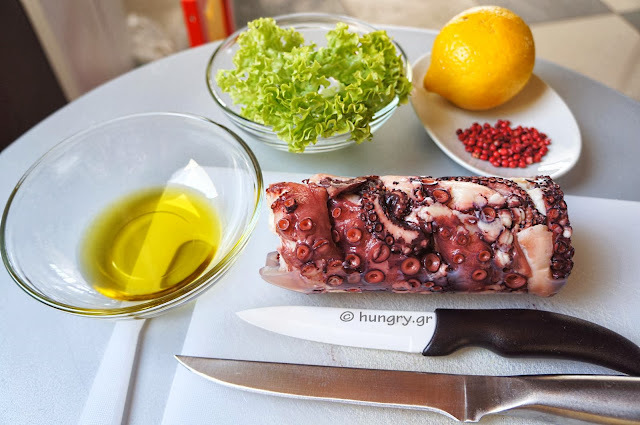 Place the octopus onto cutting board and with a sharp knife, remove and throw away the hard beak. 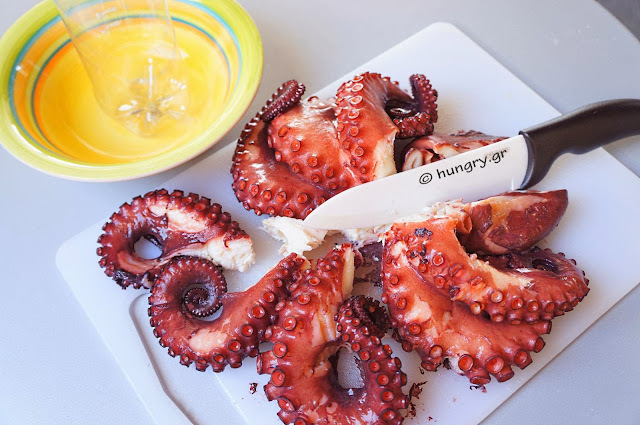 Cut the edges of the curled tentacles and set aside. 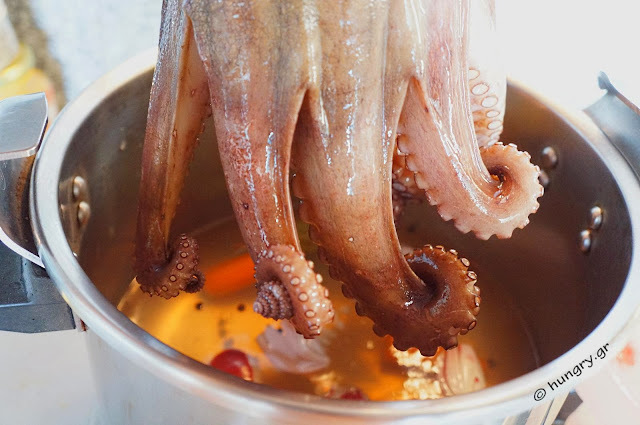 Put them in a vase with vinegar for the preparation of the octopus. 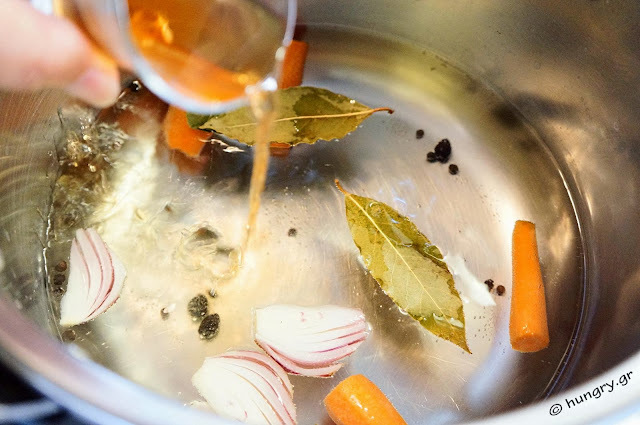 They will beautify the dish. 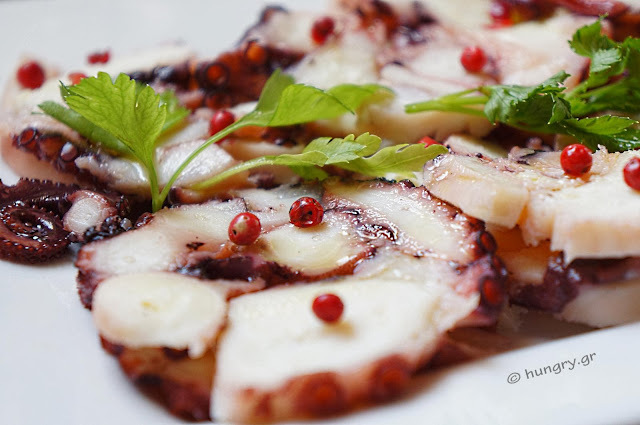 For the Carpaccio you will need 1 or 2 (depending on the amount of octopus) plastic bottles, empty. Open 2-3 slots underneath and cut the neck with scissors. Put into a bowl to collect the juice that will run. 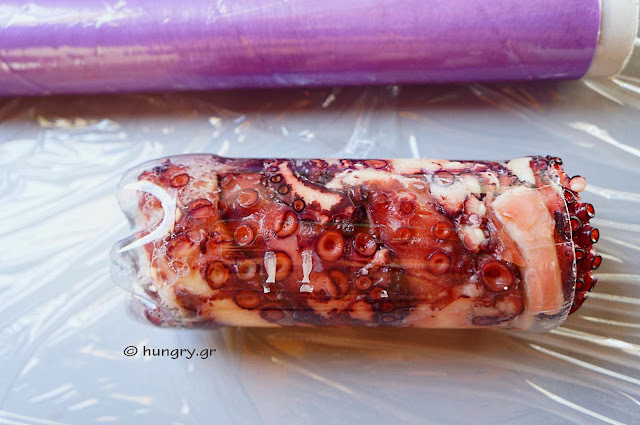 Begin to fill the bottle with pieces of boiled octopus, positioning them vertically. Press with the base of a glass, so that there are no gaps. 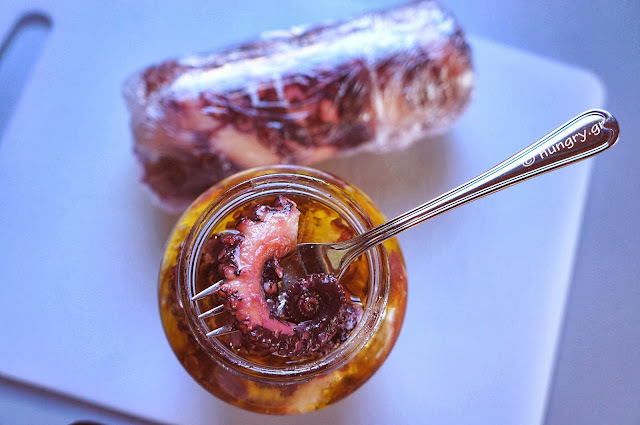 Spread a large sheet of plastic wrap and wrap it around, the whole bottle to seal. Push well the film on the plastic bottle and put it in the refrigerator, not the freezer for the entire evening. It should freeze well, so it can be cut easily in round slices. 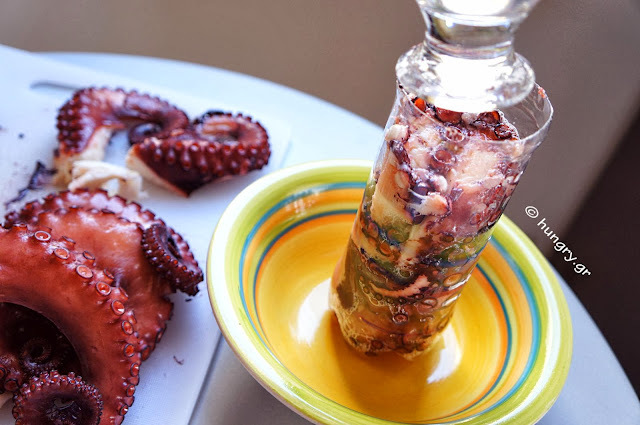 For the Octopus vinegar cut the octopus leftover in bite size and put it in a glass jar with half vinegar - half olive oil. Refrigerate to have tasty snack, whenever need. Cut and remove the plastic bottle. 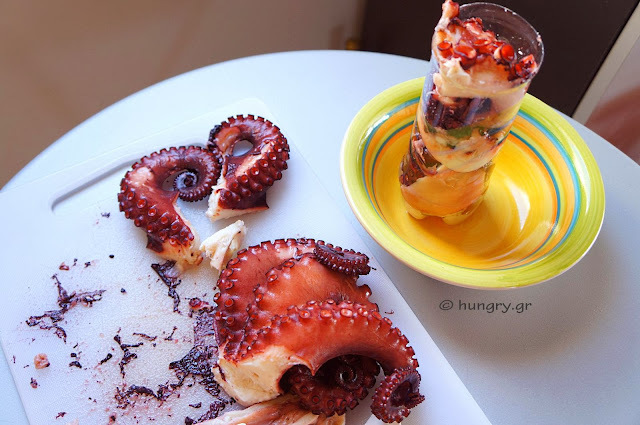 Chop the octopus into thin, round slices. Spread it on a serving platter. Whisk together oil, lemon and vinegar. 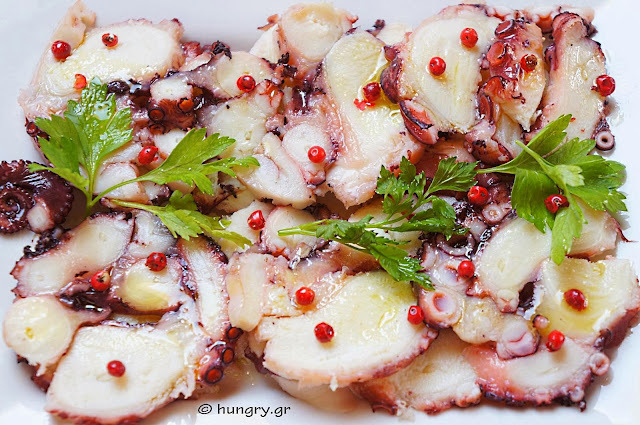 Drizzle the octopus and sprinkle with pink pepper.